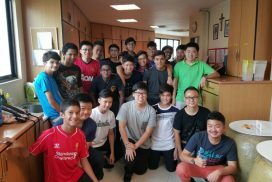 The Sacristan Ministry consist of a community of dedicated and committed members who are passionate in serving God and his people. Our members start from the ages of 15 years old and above. The ministry ensures that masses are set up accordingly to the requirements of each specific mass. We believe that through the simple acts of the Sacristan work, the faithful are able to encounter the humbling presence and mercy of the Lord. The current strength of the ministry is about 30.